Again, this is great news, and the article is a fascinating read, but does anyone really believe that its publication on the same day as a horrific, recession-foreboding jobs report is just a coincidence? Yeah, I know they said they interviewed a bunch of people (Do you really think they talked without Washington’s permission?) and said some secrets were kept secret, but… give me a break. The danger of an article like this is that the Iranians (or their patrons in Russia and China) might be able to deduce from what is said and not said crucial information — about Stuxnet itself, about how it was inserted into Iran, about who may have helped us from the inside… who knows? And that’s the point. We don’t know what they know, and thus we don’t know if anything in this article might provide them with a valuable clue or a key to a defense. Remember, it was a series of small, seemingly obscure clues that lead us to the big secret of Osama bin Laden’s location. Who knows what tidbit useful to Tehran might be found in this article? Thus the correct thing to do would have been to shut the Hell up. After WWII, the British kept the truth about Ultra secret for 29 years. With a national secret of comparable importance, Obama can’t wait 29 months to brag about it. This is an administration so self-absorbed, so puerile, that it values the security of American strategic secrets lower than the president’s reelection chances. PS: Romney 2012, because he’s an adult and can keep his mouth shut. Keep it up, Governor. Keep punching. The One has a glass jaw. Less than 24-hour turnaround. Well, done. My only change would have been to insert the blunt word “corruption” along with the more jargony “crony capitalism.” But that’s a quibble. And it’s timed perfectly to go with today’s lousy jobs report. The difference in results between Reagan’s limited-government principles and Obama’s statism couldn’t be more stark. The Labor Department just released its monthly employment report and the White House is probably not happy. There are several key bits of data in the report, such as the unemployment rate, net job creation, and employment-population ratio. At best, the results are mediocre. The unemployment rate generally gets the most attention, and that was bad news since the joblessness rate jumped to 8.2 percent. 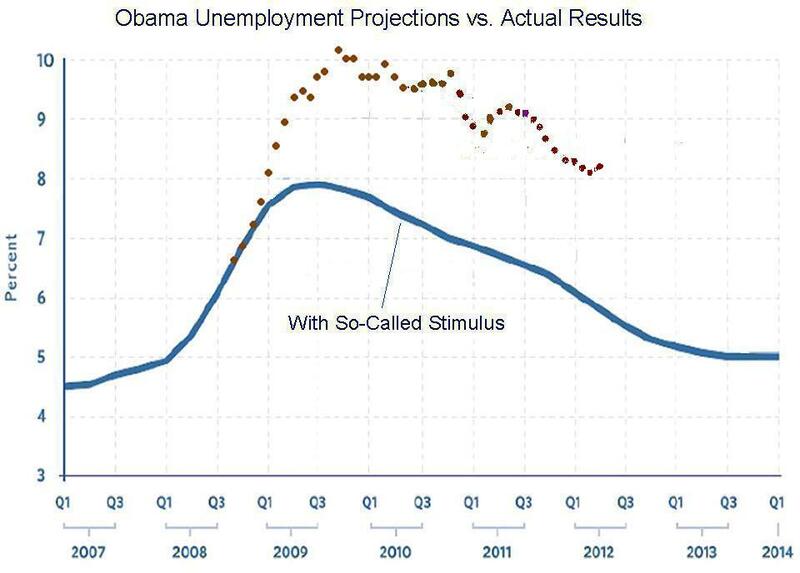 What makes that number particularly painful is that the Obama Administration claimed that the unemployment rate today would be less than 6 percent if the so-called stimulus was adopted. But as you can see from the chart, squandering $800 billion on a Keynesian package hasn’t worked. You are currently browsing the Public Secrets blog archives for the day Friday, June 1st, 2012.